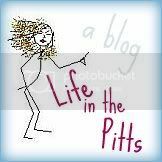 Life in the Pitts: I'm awful. You are so funny! lol For the longest time my hubs had no idea what I was spending and now that he has taken over the money (with good cause), my fun has come to an end. But he did say something about paying ourselves next paycheck. I already have my money spent if that's true. lol Glad you have a follow box now. :) I'm following. Awesome deal on the Podge. Good for you! Hahaha! I love you. That is so funny! I think you are the PERFECT wife!!! If you didn't spend money you weren't supposed to and didn't buy things that you didn't need then you'd make the rest of us look bad....and then, well, we couldn't be 'friends' anymore. So yay you!!!!! As for the oral hygiene....I'm wondering if you may find it easier to just brush as opposed to eating so much cheese and chewing so much gum. I dunno, I'm all about the easy myself!